Sniper is not a profession that readily comes to mind when naming jobs. Now I know why - it's really not an easy thing to do. This is the story of Gunnery Sgt. Jack Coughlin, a veteran sniper for the Marines, and Capt. Casey Kuhlman, also a marine. Think about what a sniper does. Apart from being an expert marksman, this job cannot be easy, for many reasons, and this book explains why. Coughlin tells a touching story of his father's work ethic, which he in turn learned, his own passion for baseball, how he was nearly blinded by a sharp stone thrown by neighborhood kids, and how he joined the Marines at nineteen where he discovered he was a great marksman despite never having used a gun before. 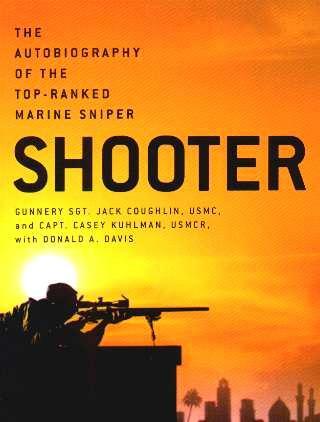 There's more to being a sniper and his comment, "...there is no such thing as a stupid sniper," resonates well throughout the book. He discovered the academics were intensive and only part of "sixteen-hour days that also included backbreaking physical exercise," that went into the making of a marine. His account of the beginning of the Iraqi war and his not being allowed to be the sniper he was trained to be, is riveting. War doesn't enthrall me but I found Coughlin's firsthand account of the trecherous active duty, compelling. It's written is easy-to-understand language and the Iraq war takes on a whole new meaning. Impersonal television shots of bombs and missiles exploding become just another flash on the screen - reading the written words of a survivor adds a new dimension to the war. I don't mean to glamorize war - I hate war - but I found this book so very intriguing and hugely explanatory. Conclusion - Highly recommended for both women and men.